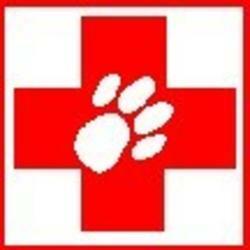 It pays to have a First Aid or Disaster Preparedness Kit ready for your dogs. You just grab it and take it along when you travel, or when a real emergency hits you. I bought some nice insulated lunch bags when back-to-school season ended for about a dollar or two as a container for the items below and filled it with items in the lists below. I put a luggage tag on the kit so that if I had it out for an emergency and it was left behind, it could be returned to me. I also chose a bag that I could use permanent marker and put the hospital cross on the sides. Maintenance tip: Don't forget to print a copy of the list for replentishing the kit, and don't forget to keep the copy of your vet record up to date! Foam curlers to cover tail-tip injuries. Surgical rubber tubing (from vet) for bloat. Use only in dire emergency - slide down throat to stomach - get to a vet! Kennel/cage/carriers to transport pets safely and ensure that your animals can't escape and for emergency housing situations. Gryhoundz (her login on many forums) has been in greyhound rescue since 1990, before there were as many organized and publicized rescue groups (before PetFinder, too). At that time, thousands of greyhounds were euthanized each year - the actual figures are widely disputed between the racing industry and rescue organizations. Her first racing season, she and a friend rescued over 100 dogs without funding or support volunteers. Gryhoundz continued to rescue as many as possible each year until greyhound rescue groups developed to handle more of the available dogs (and the number of operating dog tracks lessened). Since then, she actively worked in and with several greyhound rescue groups in her area as they developed, and continues to do so today. Gryhoundz currently owns 2 greyhounds and 4 cats (yes, they do get along very well). She has had the pleasure of raising one of these from 5 months of age, and the others fresh off the track (the other current pet is 2-1/2 years old - average retirement for these dogs, since a good share do not continue racing if they don't consistently win). She keeps her number of pet hounds low so that there is room for fostering. Many people get hooked and "chip", getting more. Gryhoundz has always enjoyed fostering because she has had the fun of knowing the many different personalities in each dog, and seeing them blossom in their new home as well.